When I related my delight in this perfect fit to my colleague Kim Corbin, she pointed out that this often happens at New World Library — the right publicist gets the right book, exactly when she needs it. And I did need this book. I was about a year into life after the sudden death of my beloved husband. Everything felt upside down. My spiritual practice had started to falter. I had lost track of what was deeply important to me. It was as if my grief were a giant vacuum, sucking up any joy, hope, or faith I may have had. 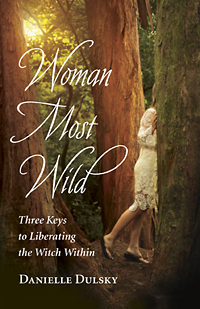 As I dove into Woman Most Wild, I felt my wild feminine spirituality calling to me from the woods behind my house. I started listening to the birds. I started doing ritual again. I remembered and reaffirmed my deep connection to the cycles of the moon and how they relate to my own personal and physical cycles. Danielle’s book lifted me up out of my grief and reminded me that I am still a vibrant, powerful woman who has the wisdom and companionship of nature at my fingertips. While working together, Danielle and I have been Witchy partners in publicity, spreading the word about her fantastic book far and wide (including all the way to the UK — if you are in London on August 7, 2017, go see her at the Atlantis Bookshop!). I take such great delight in seeing the impact her book has had on readers everywhere, and I feel blessed to play my small role in bringing Woman Most Wild to the world. I recently interviewed Danielle — a “Witch-to-Witch” chat, if you will. You can watch a video of this vibrant and playful interview here. Among many other things, we talk about being a Witch on a budget, how to let go of dogmatic practices and find your own authentic spiritual path, and how cats are better than dogs as partners in spellwork. I want to end with this wonderful excerpt from Woman Most Wild. In it, Danielle invites us all to awaken the feminine divine within and walk our life journey with pride and power. I hope you enjoy it. Every time you honor the feminine divine as part of you, as alive and well inside your psyche and body, a quiver in the energetic web of divinity surrounds us. Every time you give a nod to your Witch’s identity and acknowledge the wild within you, we move closer to a pan-gender-equal world. I urge you now to sense the profound truth of the feminine divine’s awakening in a world so pervaded with male dominance, and I am crying out for you to set a place for the Goddess at your table. She needs us, and we need Her. She is us, and we are Her. There is no wall between you and the sacred source, my love, so burn your shame. To embrace your own divinity is not sacrilege; it is your birthright. If you are able to honor the Goddess openly, do so for those who cannot. I am calling you out as a Goddess born as woman, and I am affirming your place in the realm of deity. You, Sister-Goddess, are who we have been waiting for all these Motherless years, and I stand with you as a grieving orphan longing for Her return. Come to the temple with me, and light candles for Her. Let us show Her we have not forgotten our nature, and let us sing out in unity hymns we were forbidden to learn. Teach your daughters to roll in the mud with you, and teach your sons the merit of their tears. The scent of the charred skin of women burned for their healers’ beliefs still hangs thick in the air around us, my love, but do not be afraid, for She is with us. Run with me now into the night fearlessly, and let us bleed onto the ground. I love you, Woman, and we are in this together. Come with me, and let us bring our Mother home! You are a Woman Most Wild, and your global family needs your divinity! Tristy Taylor is an artist, interfaith minister, radio host, and associate publicist for New World Library. Her husband suddenly passed away in August 2015, and she has been documenting her grief journey in writing and photos on her blog, CreateWithSpirit.com. The excerpt is from the book Woman Most Wild. Copyright © 2017 by Danielle Dulsky.